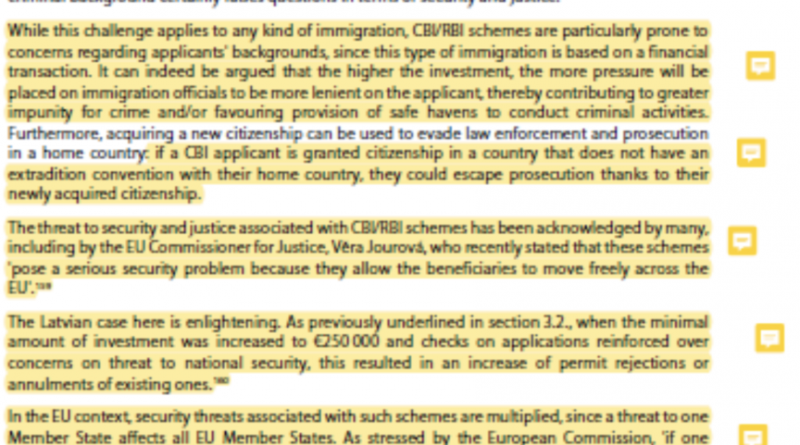 Now, these conclusions were based on another report published a month earlier titled ‘Citizenship by Investment (CBI) and Residency by Investment (RBI) schemes in the EU – State of play, issues and impacts.’ Even though it’s not clear and explicit, the report wants to affirm that jurisdictions with special tax regimes offering an RCBI are the most at risk to be used for tax evasion and money laundering. That’s a significant amount. Some pages, frankly, were filled with misleading statements; see page 47. As someone who produces many reports and reads even more, I will admit it’s quite normal to see mistakes and errors in any report, but if it is being used as the main evidence in a decision that will have an important impact, it had better be close to flawless. In this case, I found the report strongly opinionated, with many misleading and incorrect statements. coupling tax schemes and RCBI (failing to actually highlight the schemes that actually do, e.g. Gibraltar and Jersey). linking tax base erosion in the OECD with applicants of RCBI, 99 percent of whom are not from OECD countries. assessing RCBI applicants as posing a high risk to tax evasion without any proof and singling them out when one could just as easily apply the same argument to any EU national or resident. Accusing RCBI of a lax due diligence process when other immigration paths do not even have those mechanisms in place. Overall the report leads the reader to believe that RCBI applicants benefited from special tax treatment and lax due diligence. It tries erroneously to point out facts singling out RCBI applicants when they are actually applicable to every other temporary resident and, sometimes, any other resident, foreign or national. due diligence on criminal activity is a challenge that applies to any kind of migration. As the OECD pointed out, CBI/RBI schemes do not in themselves offer a way to escape reporting under the CRS, which requires taxpayers to self-certify in all their jurisdictions of residence for tax purposes. Residence status granted by these schemes indeed does not necessarily grant tax residence status. As a reader, I was genuinely baffled. I didn’t understand. During the whole report, I was having a headache because the authors were making false and illogical links. Now it looked like they knew all along and were trying to give themselves a lifeline if someone like me came out and pointed out the obvious. Quote 118 is taken from a report published in October 2014; logically, the latest data was most likely from the year 2013. In the EU, of the 20 recognizable RCBI programs in 2018, only five were created before 2012. If you don’t think it’s biased, the report then put forward a table of economic impact of the RCBIs it deems the most at risk. During the report, we were confused about when the author means a few specific RCBIs and when they mean RCBIs in general (more on that later). The author starts the report stating that most of the 28 EU members have RCBIs, then evaluates and judges the quality of the economic impact on four schemes on different timelines. The report manages to take the widest time range of 2008–2018 to highlight 9B euro in 10 years. For comparison, I estimate the economic impact of RCBIs in the EU to be 8B euro in 2018 alone. The whole report provides many accusations but supports them with only one example of how RCBI schemes can circumvent the CRS. To be clear, an RBI applicant under the Portugal golden residence permit, when (and only when) choosing the real estate option, can circumvent CRS reporting to its homeland. Now before we point out the obvious, let’s first point out that this is the only example in the 72 pages of how RCBIs could lead to tax evasion and money laundering. As most migration professionals know, any immigrant could do what is stated above. He just has to rent an apartment before opening a bank account. Most, if not all, immigration paths in Europe require an individual to demonstrate to the authorities proof of accommodation before applying for a temporary resident permit. Basically, pretty much every immigrant in Europe circumvents CRS based on that example. This really is the story of this report, accusing RCBI applicants of potential risks that could be laid on any other migrant. But the report goes further than that and asks for blatant discrimination against RCBI applicants, unsupported by facts. 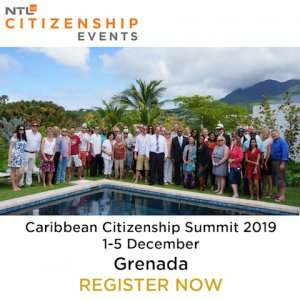 That somehow CRS tax evasion should apply more to RCBI applicants than everyone else in the community, whether they are nationals or immigrants having used other paths. Basically, if you get admitted through an RCBI, you are high risk and should have the most over-the-top due diligence done on you, whereas if you come from any other type of immigration path you are okay and nothing is done to assess your risk. The only possible tax evasion I see being relevant to the EU is when a third-country national, resident in a European country, stays over 183 days, become a tax resident, and doesn’t declare his worldwide income for taxation when obliged. But then again, his situation applies to obviously everyone, not only RCBI applicants. Which RCBI schemes are being targeted? During the report, it remains vague whether their negative critique of RCBIs is targeted to a handful of programs or all of them. They define for the report the scope of RCBI to be those inside the circle. But the language starts dissipating that line as you go through the report. The whole methodology process of distinguishing which immigration program falls under their definition of RBI and which of those are targeted in the report can lead to confusion. I don’t expect someone not expert in the subject to clearly understand it. It certainly didn’t seem to be the case when the authors of the draft report on financial crimes, tax evasion and tax avoidance of Nov. 9, 2018 “calls on Member States to phase out all existing CBI or RBI schemes as soon as possible”. Did authors Jeppe Kofod and Luděk Niedermayer writing the draft report not correctly read the RCBI schemes in the EU report specifying that only a few programs were causing concerns? 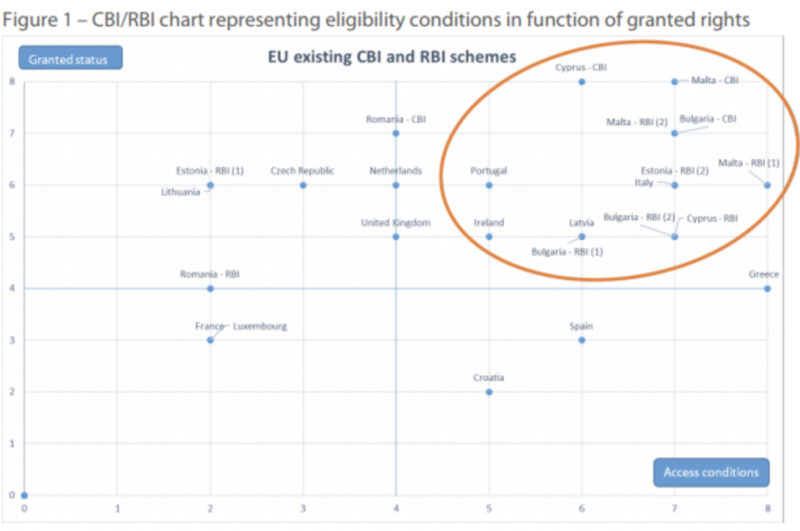 Did authors Jeppe Kofod and Luděk Niedermayer get misled by the RCBI schemes in the EU report to believe that these problems were actually related to RCBIs in general? 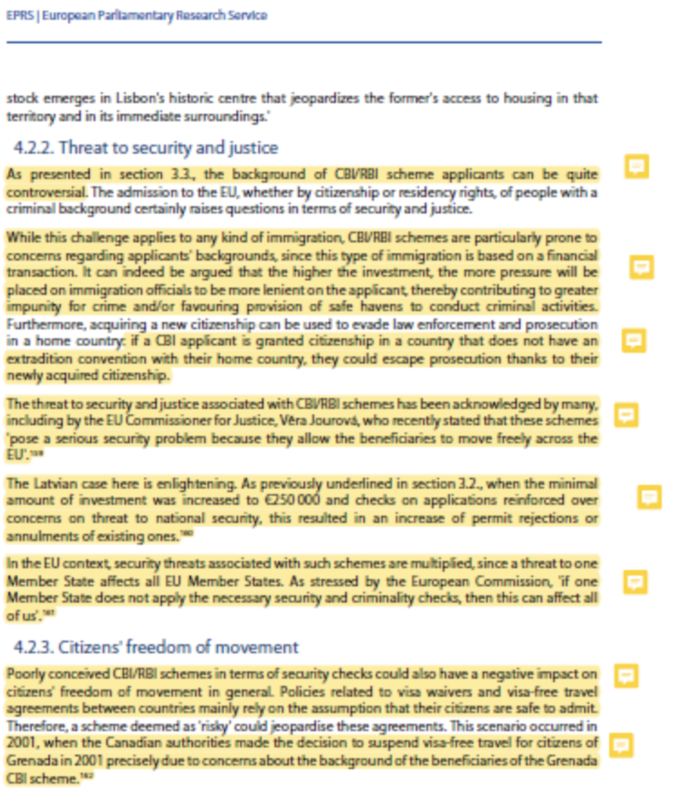 Did the authors Jeppe Kofod and Luděk Niedermayer carefully read the RCBI schemes in the EU report and not see all the holes in the analysis? 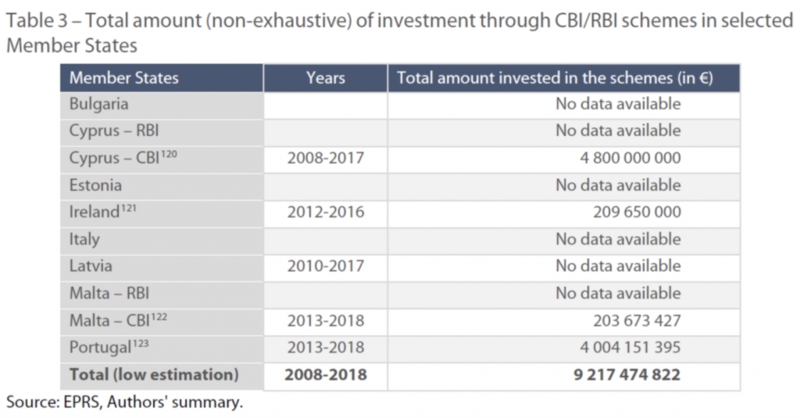 EU level CBI/RCBI, which includes all active investment programs, e.g. 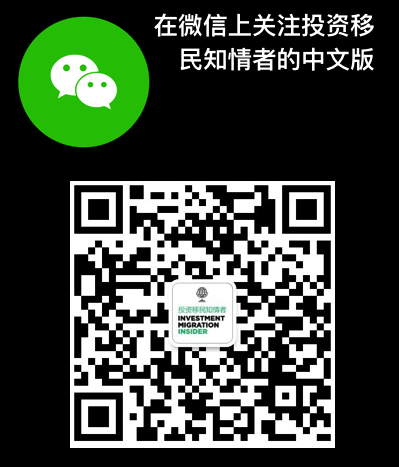 entrepreneur programs and startup visa. 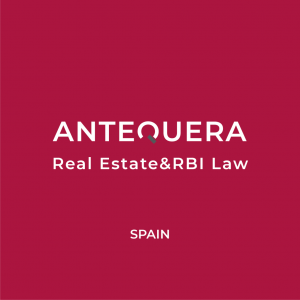 The RCBI schemes for the purpose of the study that exclude entrepreneur and startup programs and schemes that offer temporary residence. The RCBI schemes of concern in countries with special tax benefits. Why would the authors Jeppe Kofod and Luděk Niedermayer call for drastic action on policies that have a significant economic impact? What conclusions to draw from all this? After two weeks spent analysing both reports, I’m truly left baffled. Were the authors short of time? Were they given a goal to demolish RCBIs and told to find arguments that could stick? It’s really puzzling how something so biased and completely lacking any logical evidence can be used to potentially knock off billions from the EU economy. I’m not going to draw unfounded conclusions on the motivations behind these reports and why the name Vera Jourova seems to be a constant. I would rather educate people on how to use RCBIs, including entrepreneur and startup visas, to provide economic relief to an economy. I’m not saying that the RCBI schemes in the EU are efficiently built; rather, I’m saying don’t throw the baby out with the water. I humbly call on the EU to standardize the due diligence process and exercise oversight of all RCBI program in its jurisdictions. This call is not to protect the EU from unpleasant characters entering the country, but rather to protect the RCBI industry from further unfounded criticisms and biased reports. 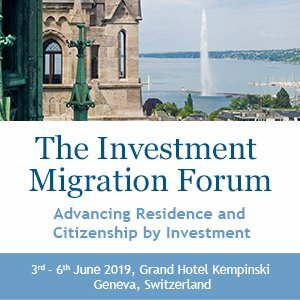 For the first reason, the EU would need to apply the same level of due diligence on everyone entering the EU, from other temporary residents to tourists. We have decided to publish all misleading statements in the 2018 STC Government Report, due in the coming month.